The Surrender. But not for long. Thus concluded the American Civil War: four brutal and bloody years, some 630,000 deaths and more than one million casualties – it remains the bleakest chapter in America’s history. But what had actually been the verdict at Appomattox? What had the Union won? What had the Confederacy lost? How could this Humpty Dumpty of a nation put itself back together again? Could there be genuine reconciliation? Lee’s surrender at Appomattox set the scene for America’s so-called Reconstruction Era, the immediate post-Civil War period that would attempt to address all of these massive questions, but would ultimately fail to resolve any of them. 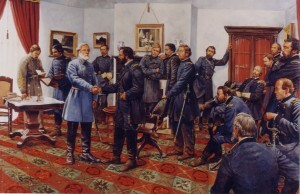 Lee might have been grateful for such generous terms of surrender on that afternoon of 9th April 1865, but the real terms emerged with the 13th 14th and 15th amendments to the US Constitution, respectively abolishing slavery, guaranteeing equal protection, and granting voting rights regardless of “race, color, or previous condition of servitude.” For the White South, these amendments were akin to the Treaty of Versailles: a red rag to a bull. The North’s revolution of Reconstruction quickly resulted in the South’s counter-revolution of White Supremacy; and there could be no reconciliation for white supremacy and black equality. Between 1868 and 1871, the Ku Klux Klan and its many imitators emerged as semi-legitimate bodies hell-bent on taking back control of the political South, and – through the most widespread use of political violence in American history – re-establishing a social order based on racial subordination and labour control. Without a great leader to usher in a new era, the Northern Republicans gradually tired of and betrayed its post-war ideals, culminating in the disgraceful Compromise of 1877. And so it happened that just twelve years after Robert E. Lee’s surrender, blacks in the South were once again under the yoke of a white master through the Southern Democrats and Jim Crow laws. The Reconstruction Era is one of the great “conveniently forgotten” periods in American history. It has none of the glory of the Civil War, just ignominy. Excellent summary of the implications of this gentlemanly surrender. The failures of Reconstruction set the nation back another 100 years. It should be pointed out that the vast majority of white northerners did not want any part of racial equality. That’s not what they fought the war for. The U. S . was a deeply white supremacist country and no amount of slaughter was going to change that. Only a lengthy and ugly continuing fight for civil rights could and mostly did.